As we go to press with Passenger Transport Express, APTA continues to monitor news about the New Jersey Transit train accident that occurred yesterday, Sept. 29. We released a statement about our industry's commitment to safety and we are reaching out to our colleagues at this difficult time. The Senate and House passed a continuing budget resolution this week to fund federal government programs through Dec. 9, allowing lawmakers to leave Washington until after the November elections. While this action will keep the federal government running for several weeks, Congress still must approve legislation to fund the government for the remainder of FY 2017. APTA will continue to advocate for a full-year DOT appropriations bill at FAST Act funding levels before Congress adjourns for the year. Read APTA's Legislative Update here. APTA Acting President & CEO Richard White, along with Acting VP for Member Services Randy Clarke and Chief of Staff Petra Mollet, represented APTA at InnoTrans, the largest rail exhibition in the world attracting nearly 145,000 visitors and 3,000 exhibitors from more than 140 countries. White also made a presentation on the challenges and opportunities for public transportation in the U.S. at a joint APTA-UNIFE session organized by UNIFE (Union des Industries Ferroviaires Européennes or Association of the European Rail Industry). The four-day event in Berlin, Germany, brought together professionals in rail operations and planning, rolling stock manufacturing, rail technology, systems integration, and suppliers of rail parts for both passenger and freight. APTA's delegation gained valuable insights into the latest international trends, met with APTA members catering to international markets, and forged closer connections with APTA partners. APTA Chair Doran J. Barnes was a featured panelist Sept. 29 at U.S. DOT's National Summit on Transportation & Opportunity, a conversation about how transportation connects people to opportunities. 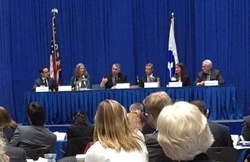 He participated in a discussion about best practices, along with representatives from the American Association of State Highway and Transportation Officials, Associated General Contractors, Association of Metropolitan Planning Organizations and National Association of Development Organizations. DOT Secretary Anthony Foxx made the keynote speech and APTA Acting President & CEO Richard White also attended the summit. Barnes cited several ways APTA is working to make public transportation a ladder of opportunity. 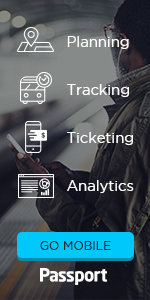 These include supporting FTA's "Rides-to-Wellness" initiative, identifying best MPO practices with the National Center for Mobility Management, and creating a profile of public transportation riders. The Fixing America's Surface Transportation (FAST) Act changed FTA’s Buy America program by, among other things, defining the “small purchase” waiver at $150,000 or less. This threshold will not increase with future adjustments. The waiver applies to all purchases made after Oct. 1, 2015, regardless of project size. It covers capital, planning and operating assistance made by grant recipients or sub-recipients. FTA's Buy America statute requires that the steel, iron and manufactured products used in FTA-funded transit projects must be produced in the United States. With the adoption of the Super Circular in December 2014, the small purchase waiver was tied to the simplified acquisition threshold in the Federal Acquisition Regulation and increased to $150,000. For the first time in APTA’s history, our Voices for Public Transit (VPT) – APTA’s online advocate community – will help raise awareness and encourage support for local and state public transit ballot initiatives. Voters in 31 communities across the country will decide referendums that could result in nearly $200 billion in public transportation investments. We have created a toolkit for the more than 200,000 VPT advocates and we encourage you to share. To access the toolkit, click here. APTA Chair Doran J. Barnes took a few minutes with APTAtv to describe his priorities for the year ahead. Click here to see a brief Q&A video with Barnes.